Six or seven cream-colored Trenton Transit busses pull up to the curb; their doors open and busloads of 1950's type teenagers jump to the sidewalk. Over on the Park Avenue side, Joe Layton pulls up with the "Blue Goose"... repeat­ing the same ritual his competitor is doing on South Clinton Avenue. The "Blue Goose!" What a bus ...beautiful velour seats, a roof-top luggage rack ...a remnant of the depression. Still another Layton bus pulls to the curb. It's "Red." He does have a last name, but we don't know it; all we know is he is a nice guy. He still doesn't have any teeth, he still needs a shave, and his cigarette has a one inch ash hanging from it. How vivid everything is in my mind! And now I'm out in the athletic field. It's Friday afternoon, and the end of another week. Don Devine, Kip Breese, and Joe Bartlett are super­vising intramural sports. We're playing softball. My team is batting ...I'm up. At home, when we play softball at Plaag's Grove, I smack the ball a country mile. Why is it when I'm playing high school sports, I can't get a hit? For that matter, I can't field too, either. I don't understand. I'm fac­ing Buddy Rick. Rick is good at all sports. He looks in at Art Perry and winks…..a windup, a sting­ing underarm fastball….. another….. then a third. I'm called out on the third strike...I'm embar­rassed. I didn't even swing at one of them. I'm such a wimp! Gene Grauer's up next. As I hand him the bat, I hear somebody say something about a barn and a snow shovel. I mumble something about a sore shoulder. I have to have some kind of excuse ...I mean ...three straight strikes...not only that they all saw me miss that fly ball out in right field ...hell, I would have one-handed that if we were playing over at Plaag's...how come? I'm confused. I sent a copy of an item from your blog to some of my classmates as a suggestion of what we could present as entertainment at our next annual class meeting. 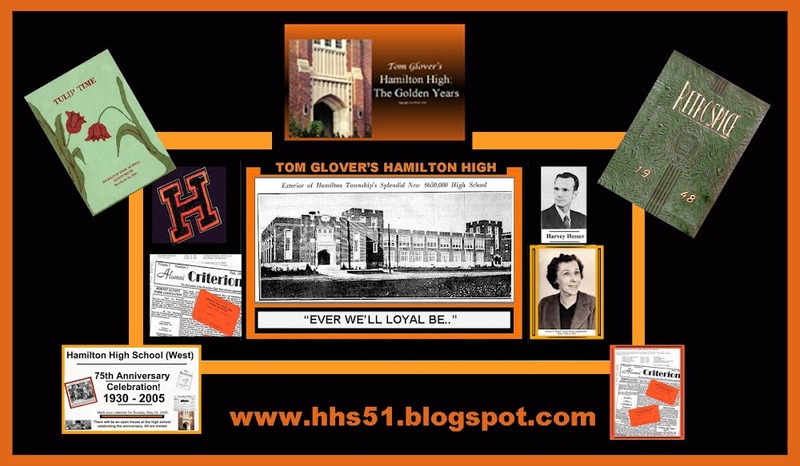 It was your piece about "day dreaming" of going back to HHS and recalling pleasant memories of those days. My question is this- Can we have your permission to quote some (or maybe all ) of that article in our presentation at our luncheon in June? We would of course acknowledge that the words are yours.